This riverside city is known as Australia's "Garden City." 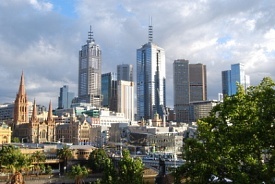 Amidst the skyscrapers of the urban center, you'll find tree-lined boulevards, the flourishing Fitzroy Gardens, the lakes and blooms of the Royal Botanic Gardens and a zoo where the animals roam freely in natural settings. The most popular tours also visit the 19th century mansions of the gold rush years and the penguins of Phillip Island as they make their way from sea to nest at sunset. From the airport, go to Melrose Dr then turn right at Apac Dr (signs for Tullamarine Fwy/City/State Rte 43.) Merge onto M2 and drive 16km, then continue onto Citylink/State Route 43 for 5km. Use the right lane to take exit 1W for M1/W Gate Fwy. Continue for 1.5km then keep left to continue on Exit W5, follow signs for Todd Rd. Turn left onto Prohasky, left onto Williamstown, right to Howe, then turn left to stay on Howe. Once you reach the roundabout, take the 2nd exit onto Beacon Rd, and at the next roundabout, take the 1st exit onto The Cove. Then proceed to turn right onto The Crescent then right to Beacon Vista. You'll reach another roundabout where you take the 1st exit to Beach Street, then at the final roundabout, take the 3rd exist onto Waterfront Pl to your destination, Station Pier.